CRMI-100RT | These flat bottom utility tanks can hold a variety of contents including agricultural chemicals, liquid feed, potable water and liquid fertilizer. Ideal for farm use, these tanks are designed to be well-suited for pressure-washing and deicing applications. 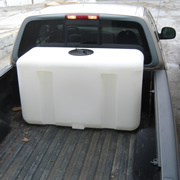 These utility tanks are made from medium-density polyethylene resin with UV inhibitors used to slow down sun damage. 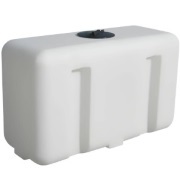 These tanks are lightweight, easy to clean, simple to install and convenient to use. Molded in grooves on these tanks provide stability and easier tie-down. An 8-inch vented lid provides access for cleaning and filling the tanks while a 2-inch fitting allows you to drain them with ease. This is a 2.0 specific gravity tank.